MLB: Are the San Francisco Giants Finally Done Defending Hunter Strickland? There’s a great scene towards the end of “Bull Durham” where Nuke LaLoosh socks a drunken Crash Davis square in the eye. Instead of accepting defeat, Davis vehemently asks which hand the young pitcher had punched him with. “When you get in a fight with a drunk you don’t hit him with your pitching hand!” He drunkenly advises. Said advice would have been handy for San Francisco Giants closer Hunter Strickland on Monday night. Except this time around, the “drunk” was a door, and Strickland made contact with his pitching hand. The result was surgery on his right pinky finger and at least 6-8 weeks of recovery time. This isn’t Strickland’s first angry outburst. But is it the first time that the Orange and Black stop defending his behavior? But Monday night’s episode may have been the straw that broke the camel’s back. Strickland went into that game with a slew of successful outings under his belt and had noticeably become calmer when taking the mound. (At least, that’s what the team claims.) Then, the closer blew the Giants’ lead against the Miami Marlins, extending the team’s losing streak against the Floridian ball club. 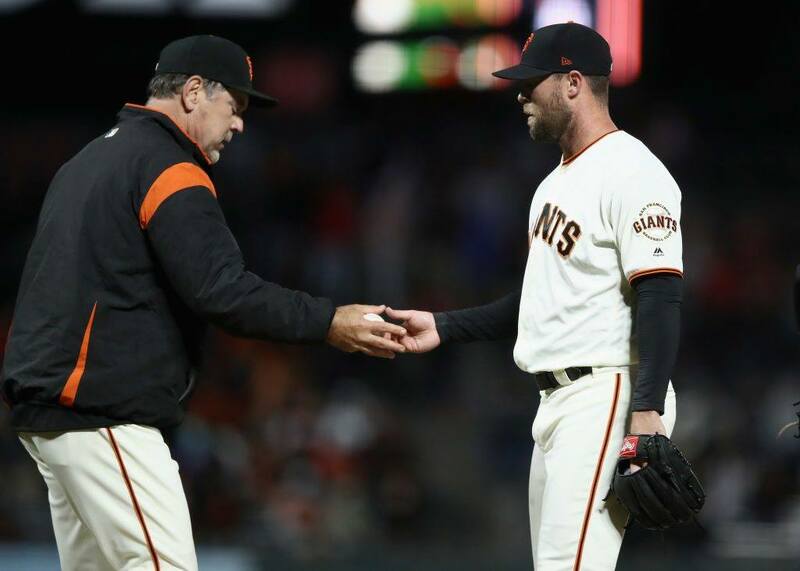 Clearly angry with his performance, Strickland told the media post-game he planned to “watch video, figure out what I gotta do to get better, and go from there.” Now, “go from there” means nursing his pitching hand for possibly two months. All he could do was take to Instagram to write a long apology to teammates and fans for his actions. Now San Francisco, who was already dealing with an injury-plagued roster, is now taxed with filling the void left by his bad decision. They’ve tried handing the closing duties off to other pitchers, including 30-year-old Sam Dyson. (Dyson was pulled from his first two save opportunities on the job.) Their priorities ahead of the trade deadline become more interesting with focus shifting to the bullpen. At a time in the season when winning games becomes even more crucial, Strickland’s decision to spar with a door just added one more thing to San Francisco’s list of problems. Time will tell how if that disappointment fades. Or if the Giants are completely fed up with Hunter Strickland’s behavior.